AnyMP4 iPad Video Converter is theprofessional Video to iPad Converting software, which can convert any video like, MTS, M2TS, TRP, AVI, WMV, F4V, OGM, WTV Bink video, FLV and more to iPad MP4, M4V, MOV, and so forth. And it will bring you a lot of surprise. Besides, AnyMP4 iPad Video Converter provides you with some amazing editing functions, so you can also personalize the video and audio effect as you like. And you can enjoy them on many portable devices like iPhone 5S/5C, iPod Nano 7, iPod Touch, iPad Air, iPad mini and others with your friends. AnyMP4 iPad Video Converter can help you to convert many popular video/audio formats such as AVI, FLV, MTS, M2TS, TS, WMV, WTV, AAC, MP3 and so on to iPad MP4, M4V, MOV, etc. video formats. With this iPad Video Converter, you are allowed to extract audio from video file and then convert it to iPad supported audio formats like AAC, ALAC, AIFF, MP3, WAV and M4A. Then you can enjoy your favorite music on iPad. This powerful iPad Video Converter enables you to choose your favorite audio track and subtitle as you like. With AnyMP4 iPad Video Converter, you are allowed to cut off any part from the source video/audio file by setting the start time and the end time and you can crop any video size by changing Aspect Ratio. Also, you can join several video clips into one whole file and then convert it to iPad supported video. 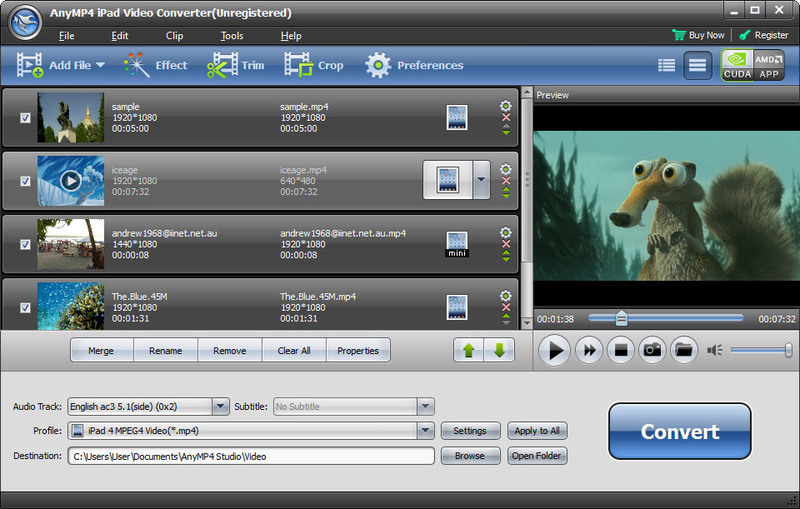 Besides, with this software you can add text or picture watermark to the screen of the video. With is software you are able to can capture your favorite pictures and save them as an image while previewing the video and share them with your families and friends. Besides, this software supports batch conversion and it has high speed and quality.